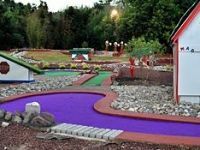 Places to play mini golf in PA. Miniature golf courses in Pennsylvania. 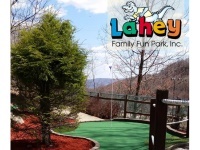 Lahey Family Fun Park, Inc.
One of the largest mini golf courses in PA! Thirty-six holes of the finest miniature golf ever constructed. You've never seen anything like it. 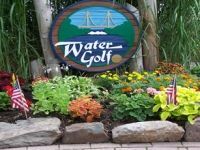 Over two and a half acres of magnificent miniature golf on a hill overlooking the Lackawanna Valley. Average hole length is forty feet, with large greens and fairways. The entire course is built in a wooded area. Many of the original trees have been left standing to create an outdoor setting that's both beautiful and relaxing. Five large waterfalls crown the entire length of the playing area forty feet above the base level. They feed seven fast-flowing streams which wind through both courses. Three large ponds at the base of the courses add the finishing touches to this perfect setting for a fun and interesting round of miniature golf. For more information check out their full page listing! 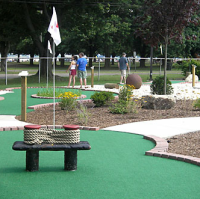 Burholme Park Golf Center has a variety of activities to partake in, including an incredible mini golf course that ranks with the best of mini golf in Philadelphia. Games are affordable, the course is always maintained, and these are just a few of the reasons why Burholme is considered among the best mini golf Philadelphia has. With its amazing courses and great equipment, this is a solid mini golf course that you should definitely check out. They also do parties and other occasions, so contact them today and find out more. 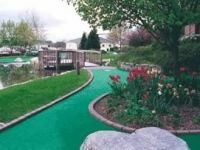 A cool and fun mini golf course in Central PA! 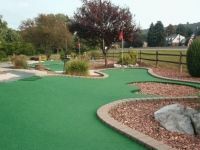 An exciting 18 hole mini golf course located in Harrisburg PA. There are many beautiful gardens and bridges all over the course. Both experienced and amateur golfers will find this course unique and fun. Great for all ages, especially young children. Open Monday through Friday 12pm to 8pm from April through October. Open 11am to 9pm on the weekends. A great place to host a children's party! The kids get to play golf while the parents can sit back and relax in their picnic area. 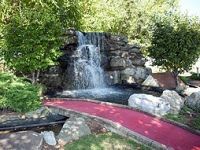 One of the most beautiful mini golf courses in central PA! Bumble Bee Hollow golf course is designed to mimic real golf greens. You will find lovely landscape and water features such as ponds and waterfalls all over the course. This miniature golf course is open year 'round, weather permitting and can also be reserved for birthday parties, church groups, scout groups, and other types of private outings. You may bring a party platter with permission. There is also a subway restaurant open during the summer season. Bumble Bee Hollows offers Frequent Player cards. Frequent Player cards give you 2 free rounds of golf every 12 rounds. Amazing 18 hole mini golf in Pennsylvania! Cluggy's is a great place to play holes of golf with the family. Especially for ages 5 and up! You will find beautiful landscapes and stone waterfalls on every hole. There is no greater place to relax than at Cluggy's. Cluggy's has many other exciting attractions such as go- karts, batting cages, arcades, and a indoor ball pit for the younger children. Looking for a great place to host your child's birthday? Well Cluggy's is the perfect place! They also offer great mini- golf birthday parties for kids from ages 2-15. There are many birthday party packages to choose from. Not just a mini golf course, it's a hole town! Mad Golfer golf course has many buildings, lakes, and streams giving it the town look. It is great for children. There is even a town mayor named Kal, you will see him around the course. When you are done sinking 18 holes, you can head over to one of there shaded picnic areas where you can have lunch and then maybe hit another 18 wholes! Open all year around with a minimum price of $6.50 for kids and $7.50 for Adults. A perfect place to go on a beautiful summer day. Not only can you play during the day, but you can also play at night. There are various lights all over the course. An exciting and thrilling 18 holes of miniature golf! A great mini golf course for the whole family! Even if you are disabled, the first 9 holes are wheelchair accessible. Bring a lunch or snack because there is a convenient picnic area on site. It's okay if you forgot a snack because Libertee serves Leiby's Ice Cream! Including sundaes, malts, and shakes. Birthday packages are also available at Libertee's. There are many different packages and themes to choose from for your child's next birthday party. Themes such as "Mickey Party", "Pichachu Party", and "Yu-Gi-Oh Party." The finest outdoor minature golf course in the Tri-State region! Two T's is the most beautiful golf course in Eastern PA! It has an amazing landscape! The course includes many obstacles including a light house and windmill. Also, it has many beautiful waterfalls, fountains, and a cave. If you are looking for great backdrops for wedding photos or any types of group photo's, Two T's is the place to take them! Cable TV's "The Learning Channel" liked the the course so much that they filmed an episode to one of there shows there! Craziest indoor mini golf course in PA! Looking to do something crazy and fun on a rainy day? Monster Mini Golf is the place to go! Located in Feasterville PA, this course is a thrill to all ages. The course is filled with black lights and almost everything is glowing, including your golf ball! Whether you go on a rainy day, or just to hang out with your friends, Monster Mini Golf has fun packed in every hole! 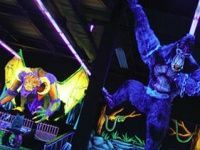 There is nothing better than spending a winter or summer night at Monster Golf! Prices are $7 for kids and $8 for adults. 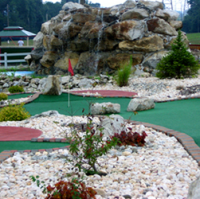 Two beautiful mini golf courses in Pennsylvania! 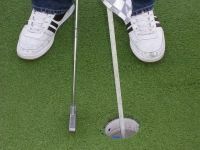 Putt U has two world class, 18 hole mini golf courses that are like none you have ever played before! The holes offer a challenge to both children and adults with its long, winding holes all over the course. Putt U is the perfect place for a family outing! Putt U is a 20 time winner of #1 miniature golf course in the region. It's a great place for birthday parties and group outings! You don't wanna miss out on what a great time you can have with your family and friends here at Putt U. 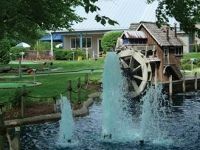 Enjoy a historical experience while playing mini golf in PA! 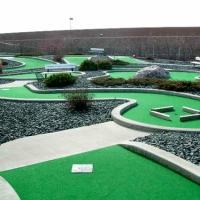 Have the time of your life playing miniature golf with friends and family in Philadelphia. This is a great place to have fun playing mini golf and learn the history of historical Philadelphia. Children have a blast playing mini golf, there is no reason the shouldn't learn too, well this course gives them that opportunity. Every hole tells a little part about the history of Philly! 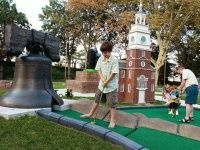 Whether your playing at a hole with the liberty bell or the Ben Franklin bridge your kids will have a blast, as you will too! Hershey Miniature Golf Fun in PA! 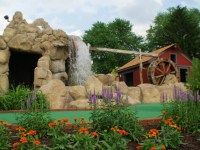 Enjoy 18 challenging holes of miniature golf on a unique and rambling course.This peaceful setting is complete with cascading waterfalls, sparkling ponds, and beautiful flowers. At night the multi-colored lights couple with the bubbling water in the ponds creates an environment of fun and fantasy. Great for any age, Adventure Golf is a true miniature golf enjoying experience. Each hole is stroller and wheelchair accessible. Golf with a Historic Twist. In Franklin Square there is some of the best mini golf in Philadelphia available, offering a large course that is filled with landmarks of the historic city. Putting between the museum of art's staircase and the Liberty Bell has never been so before! The other mini golf Philadelphia has to offer are all very solid courses, but none of them fuse history and fun like the course in Franklin Square does. With a variety of different courses to play on, low ticket prices, and beautiful scenery, Franklin Square is a great place to have some fun. At Umbria Golf Center you'll be treated to lush golfing greens that will make you want to stay forever. With a variety of courses available, Umbra is some of the best mini golf Philadelphia has to offer. Open from 9 to dusk 7 days a week, why not liven up your day with some mini golf? Mini golf in Philadelphia is a great way to spend time with the family, and is a perfect way to get everyone outside together. Games are affordable and can last as long as you want, so go today and tee up! A Fun Mini Golf Course. Tee's Golf Center is jam packed with fun activities to partake in, from driving ranges to batting cages, and of course mini golf. This is one of the best mini golf Philadelphia courses available in the area, providing entertainment for kids and adults alike. Mini golf in Philadelphia doesn't get much better than this, as Tee's Golf Center provides a challenge that isn't seen elsewhere in the city. Families with older kids will definitely want to check it out. Mini Golf Surrounded in Beauty. When you play mini golf at City Line Sports Center not only do you get a great course to play on, but you're surrounded by the beauty of the park as well. Mini golf in Philadelphia doesn't get much better than this, and anyone looking for an exciting experience should come try it out. The mini golf Philadelphia has to offer rarely gets as scenic as this. With lush forests all around you, you're not soon to forget your time at City Line Sports Center. So grab a club and come down today!